Mow Down On Some Munchies at Fried French Fry and Music Festival April 20 - Downtown Phoenix Inc. The world’s favorite side dish takes the main stage on Saturday, April 20 for the first-ever Fried French Fry and Music Festival. Located at Margaret T. Hance Park in Downtown Phoenix, Fried will feature some of the Valley’s most creative chefs and restaurants, showcasing unique and gourmet French fry samples for $2-$3 each. Larger portions for sharing (or not sharing) with friends and family will also be available. With 30-plus fry creations featuring everything from carne asada and pulled pork to kimchee, chorizo, even lobster – there are toppings and flavors for just about every palate. 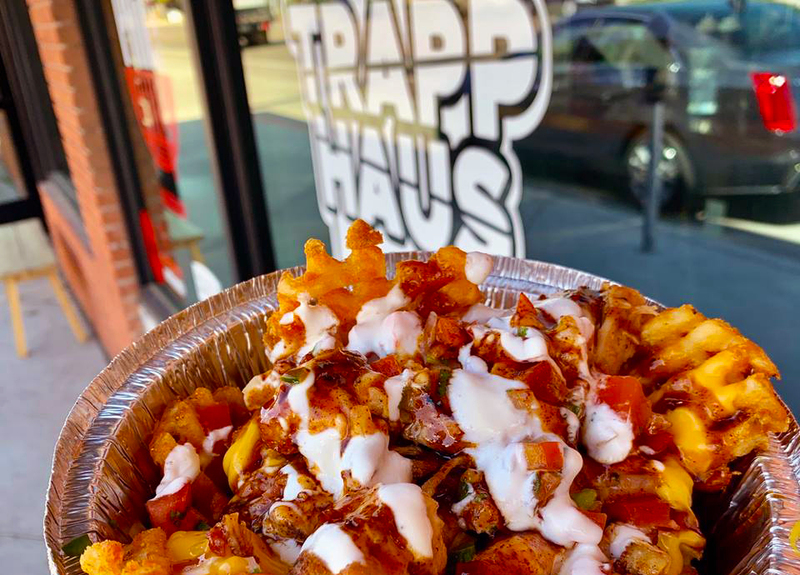 French fry makers include Frites St, Chula Seafood, French Me Fry Truck, Handlebar Diner, The American Poutine Co, Trapp Haus BBQ, Sr. Ozzys Tacos y Mariscos, Merkin Pizza Wagon, The Closet Vegan, Churro GoNUTZ, Rock-A-Belly, Provecho, and many more. To quench your thirst between samples — beer, wine and margaritas will be available for $6, and Mexican soda brand Jarritos will be serving up delicious soft drinks. Besides all-you-can-eat crispy fried goodness, it’s also a great way to experience the best music Arizona has to offer. The music lineup includes local bands Fairy Bones, decker., Please, Mr. Mudd & Mr. Gold, Gus D Wynns & The Breakers, Weird Radicals, Maintenance, Reverse Cowboy and Stoneypie. For those looking to get there car-free, Phoenix Spokes People will provide bike valet (free of charge), and the Roosevelt Street light rail stop is just a block away. The first 25 bicyclists riding to Fried with Downtown Pedal Around will get free tickets to the festival, in addition to a fun leisurely bike ride with friends. The group ride leaves from Civic Space Park at 2 p.m. The inaugural Fried Festival is produced by the founder of Arizona Taco Festival, Phoenix Pizza Festival, and Downtown Donut Festival, and benefits Downtown Phoenix Inc., a nonprofit organization promoting downtown’s continued revitalization. When: Saturday, April 20, 2019, from 2-10 p.m.
FAQs: Festival is rain or shine, cash and credit accepted, service dogs and dogs under 25 pounds are allowed on a leash, one sealed water bottle per person is permitted, lawn chairs and blankets are permitted, and ATMs will be available on-site.